"[My experiences] at Miami, have definitely given me a lot more confidence…Learning to communicate with many kinds of people has truly helped me feel more confident with what I've learned and experienced, especially over the past year." "Before I visited, I had never heard of Miami before because it's a 5-hour drive from my home in New Franklin. However, I learned of Miami's great acceptance rate into med school and ended up getting into the Honors program. Those two points are really what got me here. "When I came to Miami, I knew I wanted to be a doctor and already had an interest in the pediatric ophthalmology field. This specialty choice came from my passion for children with vision impairments caused by birth defects or abuse-related injury. My decision solidified last year after spending some hours in the OR and realizing that I wasn't too squeamish! 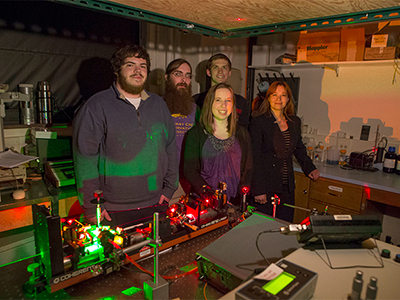 Briana Vamosi (front center) poses in the physics lab with (L to R) students Jacob McFarland, Phillip Arndt, Patrick Boyle, and associate professor Burcin Bayram. "From the beginning, everything has been wonderful for me here. I started with a Chemistry major and Premedical Studies co-major and then realized that I also liked biochemistry, so last semester I added that. I really love chemistry—how it is presented, how you get to solve problems. I love the math and the science and how everything is combined into one. "Looking for something that was chemistry-related, I joined the First Year Research Experience (FYRE) program, which enables students to get involved in faculty research. Dr. Burcin Bayram's research project soon spiked my interest. She's in the physics department and works with optics and lasers, but this is related to the eye medical industry, and her work in measuring energy transfer overlaps with my interest in physical chemistry. I really liked what she was working on and joined her lab the second week I was here!" "Coming from a small town, I was a little nervous about finding my niche at Miami. But once I settled in here, I found a really good group of people and got involved with great organizations. Miami offers a very positive atmosphere. "This semester I'm living in Scholar Leader, an upperclassmen dorm for students who have been given special scholarships, and I've enjoyed hanging out with new friends and sharing different experiences. Even though many of us have only just recently met each other, we've become a very close-knit group, and I can tell that we are all going to become really great friends. It's something really cool and fun about college. 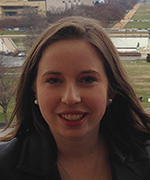 "My work in Dr. Bayram's physics lab has been incredibly interesting, and I've learned a lot. I work on the proton excitation of iodine, which means I shoot a laser through a cell of iodine and see how that fluoresces under those two beams of light. We use a monitor to take in those fluorescents and figure out what the iodine is doing. 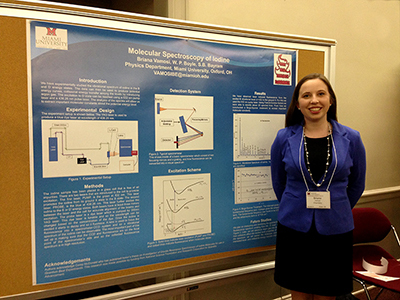 I even got to present my research with about 10 other students on 'Posters on the Hill,' a study-away trip to both DC and Columbus that focuses on undergraduate research experiences and poster presentations. Briana Vamosi poses with her 'Opening Minds Through Art' partner. Her partner's art work is directly behind Briana. "I also had an Honors experience last semester, which was a volunteer program through the Scripps Gerontology Center called 'Opening Minds Through Art.' I went to a local nursing home to learn how to work with dementia patients and those with various forms of Alzheimer's. 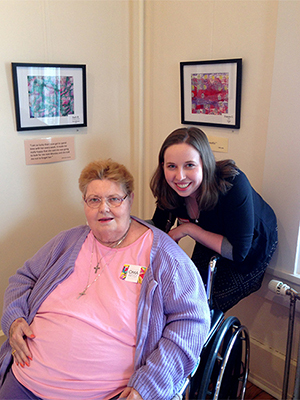 I was paired with one resident the entire semester, and we did an art project every single week. Different people have different levels of dexterity, and we helped them to make opinion-oriented decisions, such as, 'What color do you like the best?' We learned to communicate with them in a way that was comfortable for them, and it was an incredible experience that culminated in an art show at the end of semester at the art center Uptown. Their works were displayed, as well as a slideshow, and their family and friends came to support them. My partner really grew throughout the semester, and just seeing how much she opened up and loved the art and getting to talk with people was really cool." "I'm a chemistry and biochemistry double-major, and on top of that I have my Premedical studies co-major, which is a little bigger than a minor. However, when I apply to med schools in the near future, it won't all be about my science classes. The liberal arts courses I've taken at Miami—including education, philosophy, and art—will help me present myself as a unique and well-rounded applicant. "I probably wouldn't have taken those liberal arts courses normally as a double major in the sciences, but they ended up being some of my favorite classes here at Miami. They really helped me use my critical thinking skills in a different way. The liberal arts has also exposed me to working with different people who don't have the same kind of work style that I do." Meeting Political Leaders in Columbus and D.C. for "Posters on the Hill"
"'Posters on the Hill' is made up of undergraduate Miami students from different majors and backgrounds who are given the opportunity to meet with and present their research to legislators from both the state and national levels. Our group spent several days at both the State House in Columbus and the Senate and House of Representatives in Washington, DC. We had open communication with different political figures about all kinds of things, including our research, economic applications, politics and public service, and career advice. "First, in Columbus, I met a doctor who after retiring decided to go into public service. This is something I am possibly interested in the future. Her advice was very eye-opening and made me realize I could have interests in more than one place for my future career. Then, in DC, we went behind-the-scenes on a tour of the floors of the Senate floor and the House of Representatives. It was a great privilege to see our government in a different way and to have really great conversations with everyone from pages to senators. "By the end of our two-part trip, our entire group had collectively participated in over a hundred meetings! We also gave poster presentations in both cities, in which people came to listen to our research. We explained how our research is applicable and useful and how it could be promoted. It was great to be able to look at my research and consider how to make it economically viable for the state of Ohio, or even the country. "This experience, among others I've had at Miami, has definitely given me a lot more confidence. I'm more aware of what I know and am able to communicate that, while at the same time understanding what I don't know and being able to ask questions. Although I work in a physics lab, for example, I'm not a physics major and have only taken physics classes for pre-med. I can make suggestions such as 'What if we did this instead?' Learning to communicate with many kinds of people has truly helped me feel more confident with what I've learned and experienced, especially over the past year." "Your first few weeks during any semester can be very intimidating, whether you're a freshman or an upperclassman, but stick with it. Take things one day at a time, study hard, and allow yourself to experience and explore different areas. "For research, don't be afraid to get involved early. I did, and that was one of the things that really brought my freshman year together. Now, having spent 3 semesters in the lab, I feel I've really developed what I know as my classes become harder. Getting started early can make sure the research lab fits your lifestyle—you don't want to be switching labs every semester!"